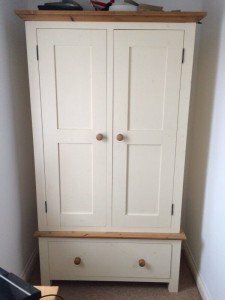 A large farmhouse style white solid wood double wardrobe, having one drawers to the bottom. 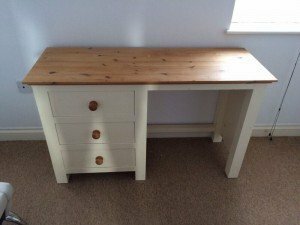 A white farmhouse style solid wood vanity dresser, having three drawers to the side. 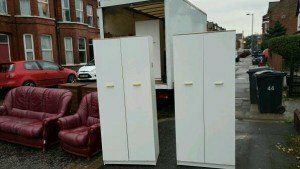 A pair of white tall standing solid wood double wardrobes, together with a purple three piece sofa suite. 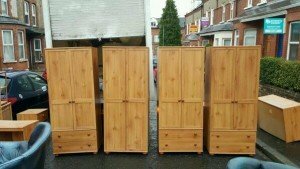 Four solid pine double wardrobes, three of them matching with two drawers to the bottom, one without any drawers. 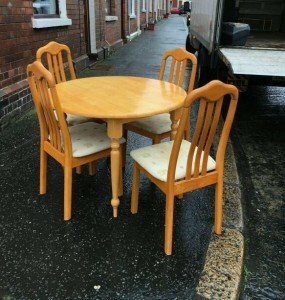 A solid wood round dining table, together with four matching chairs upholstered in white patterned fabric. 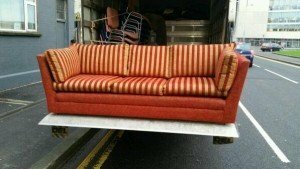 A vintage three seater low back sofa, upholstered to the base in terracotta fabric, and to the seating in striped terracota and gold. 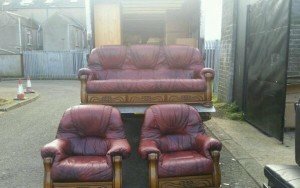 A three piece vintage sofa suite, comprising of a three seater high back sofa and two matching armchairs, upholstered in ox blood red leather on solid wooden bases. 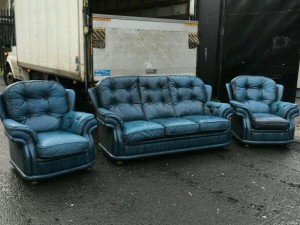 A three piece vintage Chesterfield sofa suite, comprising of a three seater high back sofa and two matching armchairs, upholstered in ink blue leather with button back detailing. 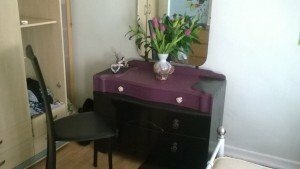 A black and deep purple hand painted three drawer dresser with flower head knobs, together with a black leather desk chair. 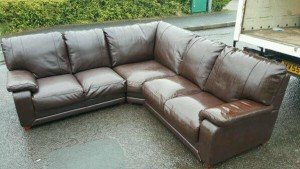 A large five seater corner sofa, upholstered in chocolate brown leather, on solid wood feet. 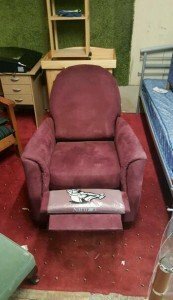 A lazy boy reclining gentleman’s club armchair, upholstered in purple velour fabric. 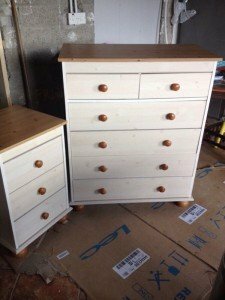 A tall chest of solid wooden drawers, having two small drawers with four large drawers underneath, together with a matching three drawer bedside unit. 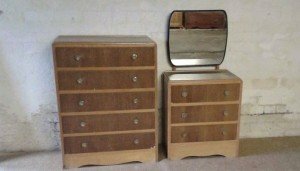 A tall standing solid wood chest of five drawers, together with a matching three drawer mirrored vanity dresser. 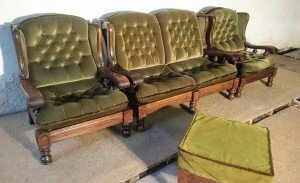 A four piece wood framed vintage sofa suite, comprising a two seater high back sofa, two armchairs and a square footstool, upholstered in green velour with button back detailing. 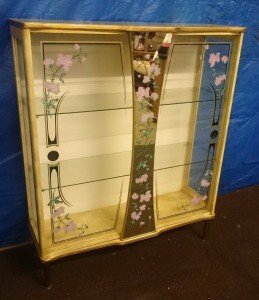 A retro solid wood and glass display cabinet, having two removable glass shelves inside and floral painted glass doors. 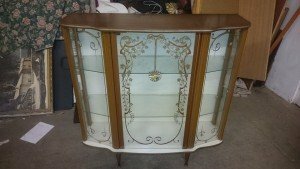 A retro solid wood and glass display cabinet on cone feet, having two removable glass shelves inside and patterned glass panelled doors. 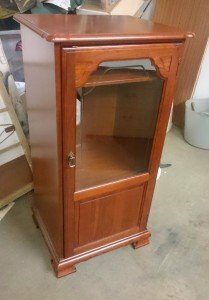 A solid wood tall standing bedside cabinet, having a glass inlaid door and inner shelving. 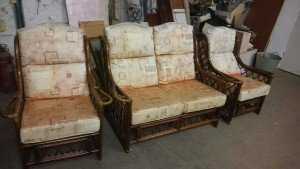 A three piece conservatory sofa suite on a bamboo base, comprising a two seated high back sofa and two matching armchairs, upholstered in patterned fabric. 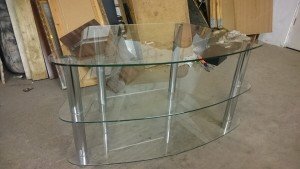 A three tier chrome and glass shelved entertainment unit.